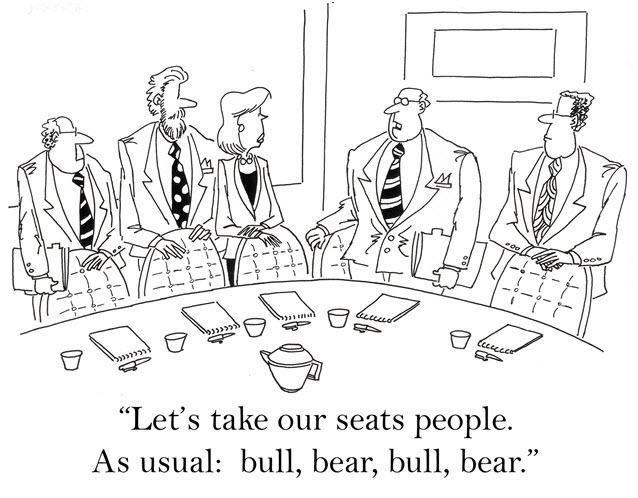 There are seven members of the board. Each member is appointed by the President to the Board of Governors and serves 14 years. They can be reelected. The board is headed by a President and Vice President. Each can hold office for 4 years and can be reappointed by the Senate. Janet Yellen currently serves this role and is the successor to Ben Bernake. Alan Greenspan held the position prior to him. The goal of each monthly meeting is to determine the liquidity of funds within the country and establish prices that will keep the economy stable. If the circulation of money within the country is abundant, the prices will increase. If the circulation of money within the country is minimal, the prices will decrease. The goal is to find a balance that will keep the economy stable and full employment. It is generally easier for central banks of core economies to fight inflation rather than deflation, so they typically target a moderate postive rate of consumer price inflation around 2%. Typically the Federal Reserve sets short term interest rates and longer dated Treasury bonds trade at a premium to those rates to reflect the duration and inflation risks. The 30-year mortgage typically trades at a slight premium above the 10-year treasury. The reason the longer duration mortgage rates are based on the shorter duration trasury rate is most homeowners tend to move or refinance roughly every 5 to 7 years. In 2017 there were about $600 billion in mortgage refinance loans & $1.09 trillion in purchase mortgages, so purchases were nearly 2/3 of the market while refis were slightly more than 1/3 of the market. As rates are expected to keep rising, refinance is expected to make up a smaller share of the overall market. The amount of new loans to refinance a home was expected to drop to $430 billion, down 28.3 percent from 2017, while the amount of new mortgages to buy a home will likely increase by 7.3 percent to $1.2 trillion, MBA said. As of July 1, 2016 the United States has a population of 323,127,513. The US gains a person every 18 seconds and is estimated to have a population of 326,965,105 on December 31, 2017. The following table highlights the July 1, 2016 populations of states & territories based on United States Census Bureau estimates. All table columns are sortable. Click on the column headers to sort by that column. Click again to sort low to high. States with higher levels of population growth typically see the increased real estate demand drive faster real estate price appreciation. There are over 300 cities across the United States which have at least 100,000 residents. Over 40% of these cities are located in just 3 states: California, Texas & Florida. Typically during economic expansions real estate prices increase faster in large cities than they do in rural areas. Here is a table of cities & Census Designated Places across the United States with a population above 100,000. Mortgage rates vary depending upon the down payment of the consumer, their credit score, and the type of loan that will be acquired by the consumer. For instance, in February, 2010, the national average mortgage rate for a 30 year fixed rate loan was at 4.750 percent (5.016 APR). The 15 year fixed was at 4.125 percent (4.312 APR) and the 5/1 ARM was at 3.875 percent (3.122 APR). These prices are just a snapshot of the average and will constantly change day to day, though the relative values will remain roughly the same. Namely, longer duration debt & fixed rate loans are typically charged a higher initial interest rate to lock in the certainy. This relationship makes sense because homeowners have the ability to refinance a fixed rate mortgage if rates drop, but if interest rates increase lenders have no way to adjust the fixed rate upward. The Consumer Fiance Protection Bureau offers a home buyer's checklist and a free online tool for checking typical mortgage rates within your state for a given credit score range. Fixed rates are based upon the national average, but vary from state to state. They possess the same interest rate throughout the duration of the loan. Consumers desire these loans if they plan to remain in their homes for the duration of the loan. For example, the consumer obtains a mortgage when interest rates are at their lowest and then interest rates rise. The consumer does not have to worry about their rates increasing because the interest rate is “fixed”. If the interest rates decrease, the consumer may have the option of refinancing, if the costs of refinancing are less than the overall savings. These loans are typically available in 15 year and 30 year loan options. The rates are higher than variable rate loans, as consumers pay a premium to lock in the security of a fixed rate while maintaining the ability to refinance. The longer the term, the higher the rate, because banks will lose money as purchasing power decreases due to inflation. Adjustable rates are typically lower than fixed rates when the loan is initially established. ARMs may adjust on a monthly basis in keeping with the Federal Reserve or on a bi-annual or annual basis. The consumer should be aware that as interest rates increase, so will their monthly payments. While ARMs may be appealing because the initial rates are lower, ARMs can also be a gamble. ARMs may be beneficial to investors or consumers who only plan to keep the loan for a short period of time. During that time, the consumer can enjoy low interest rates. 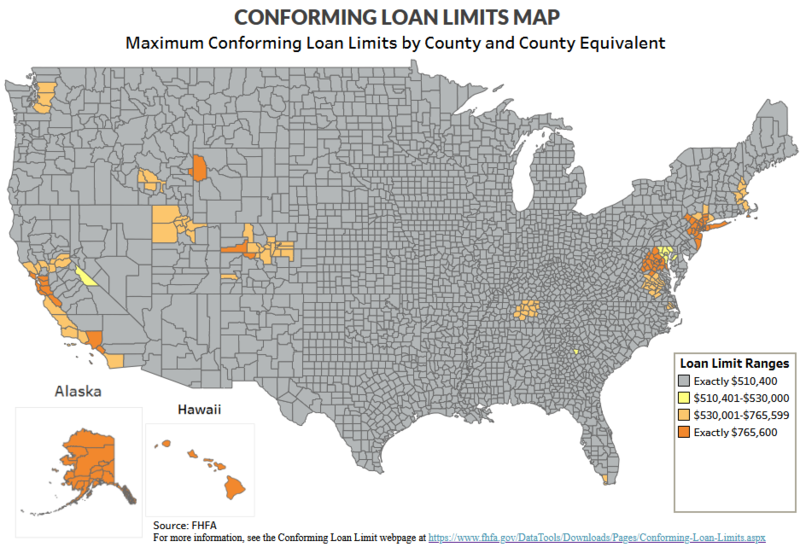 The FHFA offers an interactive map of conforming limits by county. A static version of the map is included below. The FHA secures loans made by private lenders. These loans are provided to Americans who have a low to middle income. This loan is available to those people who cannot afford a large down payment or higher interest rates. 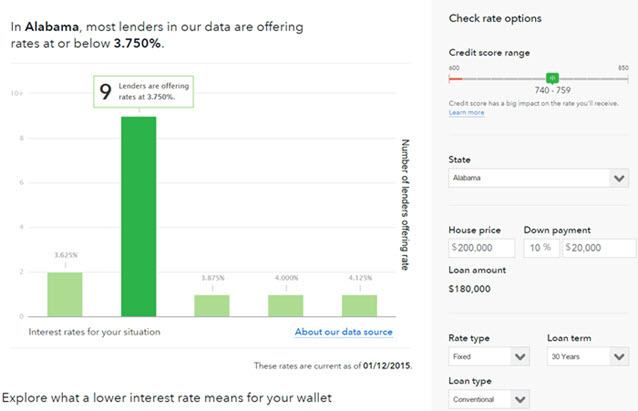 Interest rates for these loans are lower than the national average for a fixed rate loan. Individual banks determine the interest rates; therefore, the consumer should do research prior to accepting a loan at a particular bank. The consumer can receive a loan for as little as 3 percent down and also receive as much as 6 percent on closing costs. This means that the consumer can borrow up to 97 percent of the cost of the home. Fixed rates are best for individuals who intend to remain in their homes for the duration of the loan. The initial interest rate may be higher than an ARM; however, there will be no hidden increases over the duration of the loan. During the fixed rate period of a hybrid ARM, the consumer can enjoy the low interest rates and low payments. However, individuals who are not prepared may see an increase in their loan premiums that they cannot afford. ARM interest rates change each month with the Federal Reserve. This loan is typically recommended for a short term investor who will sell quickly. The best time to secure a mortgage or refinance is when the rates are the lowest. Compare the National Mortgage Rate average over the past 10 to 20 years. If the rate is at one of its lowest points historically, then it can be a safe entry point into the market. Many investors over-extended themselves by purchasing multiple properties when prices were high. If the market turns, the home buyers may owe more than the house is worth. Those who wish to sell cannot fully recoup the costs of the home. Therefore, instead of having equity in the home, consumers owe more than the home is worth. Many individuals, in this instance will negotiate with the bank and “short sell” in order to relieve themselves of the debt. A person who is making a purchase where they are using a large down payment or paying cash would likely be better off buying when mortgage rates are higher, since most people (who may compete to buy the same property) budget based on the montly payment rather than the total price of the house. Below is a chart of historical montly mortgage rates from the Federal Reserve Economic Data series. A home is not just an asset, but also has many costs beyond financing; including regular repairs, homeowner's insurance, and property taxes. If your down payment on a conforming loan is below 20% of the home's value you will likely be required to carry private mortgage insurance (PMI) until the loan's balance is below 80% of the home's value. Government loan programs like FHA and VA loans do not require PMI, however they have their own seperate insurance requirements, which may require the insurance to remain throughout the duration of the loan. Beware of ARMs. The interest rates will typically increase after the introductory period and may cause a home buyer financial stress when the rates increase. Some individuals even foreclose when this happens, because they cannot handle the increased payments. Purchasing mortgage discount points can be a viable option if you are fairly certain you will live in the house for many years. However, if you move after a couple years then paying a significant upfront fee to lock in lower rates for the life of the loan will be money wasted. Other hidden costs may be associated with refinancing. For instance, an individual with a fixed interest rate may decide to refinance the loan if the interest rates decrease during the duration of the loan. However, the consumer must incur costs to have the loan refinanced. The consumer should make certain that the cost of refinancing is less than the savings from a lower interest rate. Otherwise, refinancing may not be in the best interest of the consumer. Some loans also contain pre-payment penalties, which increase the cost of refinancing.